DocPro DMS helps you to ensure and get complete control over your digital assets. Has physical piling of your documents become a big pain? Are you scared about the safety of your company’s sensitive data? Are your media assets unorganized? If your answer to any of the above is yes then, it’s time you replace the bulky cabinet files with DocPro Document Management System. DocPro DMS is an excellent document management software that helps boost your business efficiency, increase productivity, reduce expenditure, become more organized and brings many benefits to your organization. What does DocPro Document Management System do for you? In simple terms, DocPro document management software is a solution that enables the digital management of documents. It is a framework that makes easy the administration of advanced reports used to manage, track, and store archives. You can track and store all documents in a central location using DocPro DMS over the intranet of your organisation or on cloud. You can put all your important documents on DocPro DMS, like work guidelines, strategy articulations, and techniques, ensuring that everything is under control. Disorganized and unsupervised documentation work can result in business loss and or even hamper the business’s sensitive information. DocPro DMS is brought to you by Chrome Infosoft Solutions Pvt. Ltd. which has many years of experience in document management, digitization, workflow management etc. DocPro is an easy to use and cost-effective solution for your document management needs. 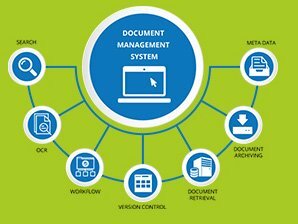 DocPro Document Management Solution empowers business organizations to have complete control over their organization’s documents and maintain the safety and integrity of the information. It is an excellent product incorporating some highly innovative features, such as workflow automation, full-text indexing, collaboration features, advanced search features, sharing, versioning, and much more. With advanced security features that ensure that access to any of your sensitive information is controlled, DocPro is an excellent way to gain centralized document storage for your business. DocPro DMS – Why it is Unique and Innovative? DMS Software from Chrome Infosoft is an advanced tool used by many companies spanning various industry segments, to store and track electronic documents and scanned images of paper documents. DocPro document management software helps the enforcement of your organization’s record management policies. 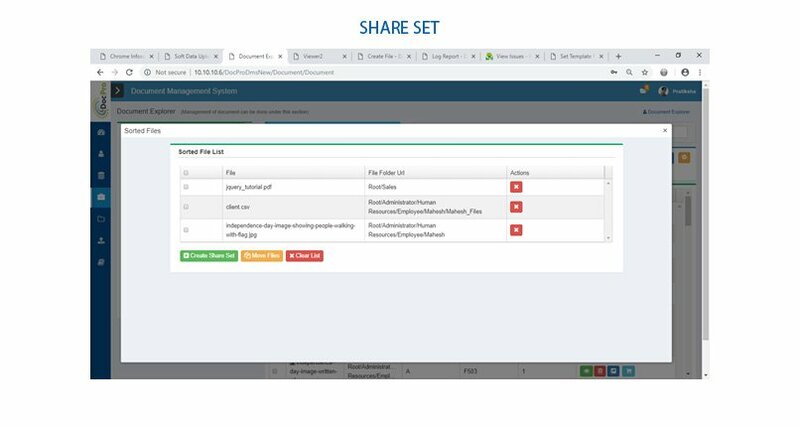 At the same time, it allows you to conveniently store, obtain, and share diverse data related to the various business processes in your organisation. DocPro incorporates numerous rich features that are innovative and unique to it. For this reason, it is already been used in numerous industry domains, like BFSI, Telecom, Government Organizations, Defence, and more. Another unique aspect of Chrome Infosoft’ s DocPro is that it comes with a simple interface to manage, capture, serve, and store records and documents. While there are many document management systems available in the market, one thing that makes DocPro software best among others are its features. DocPro document management software from Chrome Infosoft is a unique solution offering a range of wonderful features to the users. Some of the important features in DocPro are as follows. Click here to get in touch with us for a detailed demonstration of all the features. Here we list some of the top-notch features of this document management software. Strong access control ensures that the documents do not fall in the wrong hands. 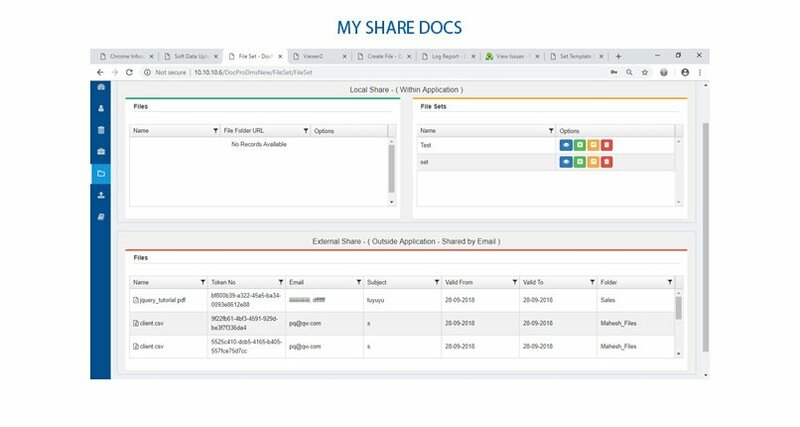 You can define not only who gets what but also what the user can do with the received document, for example you can control whether the user can only view or download, print, share, change version number etc for the document that one can access. 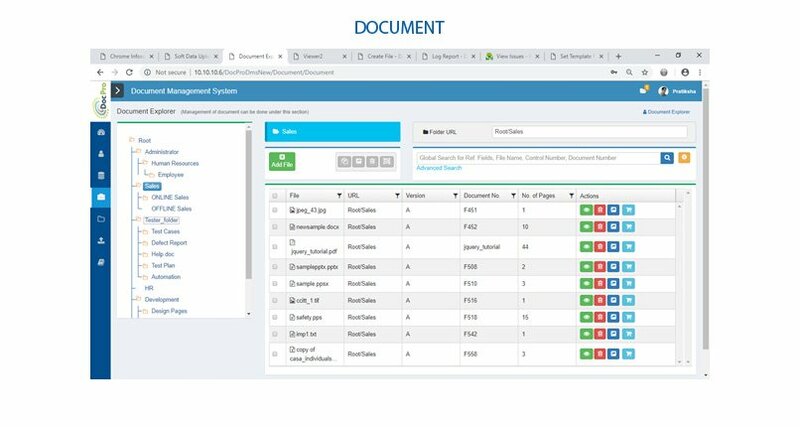 DocPro gives you the ability to configure the access control up to the page level of the document, so that you can choose not to give access to a user for a particular set of pages within a document. DocPro maintains version control by default. You can customize the version numbers as per your requirements. You can define up to four-part version numbers. Users desiring to update a document can check-out the document. A checked-out document can be viewed by other users, but they cannot check-out the document for update. The user who has checked-out the document uploads an updated document. The version number is updated for the document. The older version and newer version are both available on DocPro DMS. The check-in/check-out feature avoids accidental overwriting of documents as multiple users cannot update the same document at the same time. DocPro DMS is meant for collaboration between different teams and users in your organisation. Sharing of documents with the users of DocPro and with others using email is one of the many collaboration features. 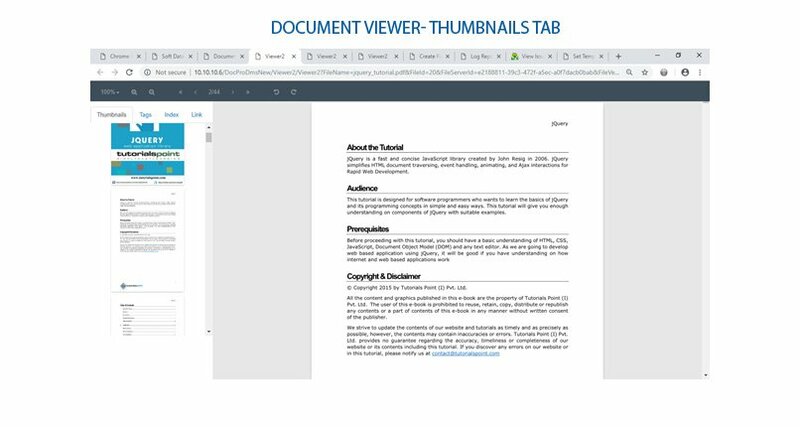 Annotation allows users to highlight text and sections within the document. Users can give their comments on the highlighted sections which are visible to other users. Other users can also highlight and comment. 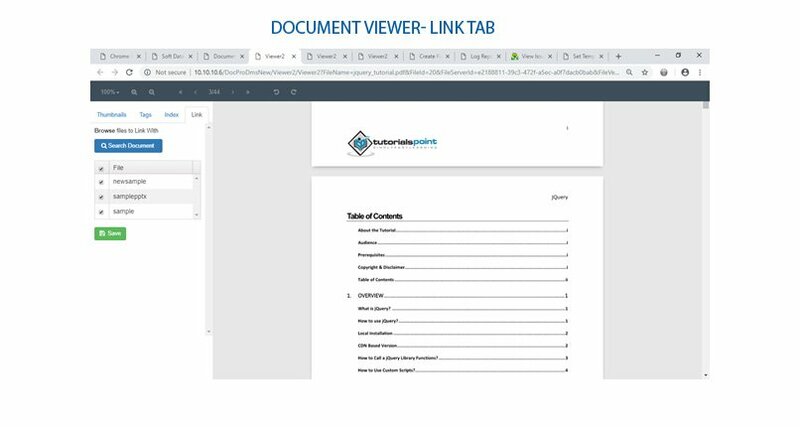 All comments are stored in DocPro so that you get a complete view of the discussions had between the team members related to the document. Annotation feature gives you multiple options like area, point, polyline etc. to highlight the sections in the document. 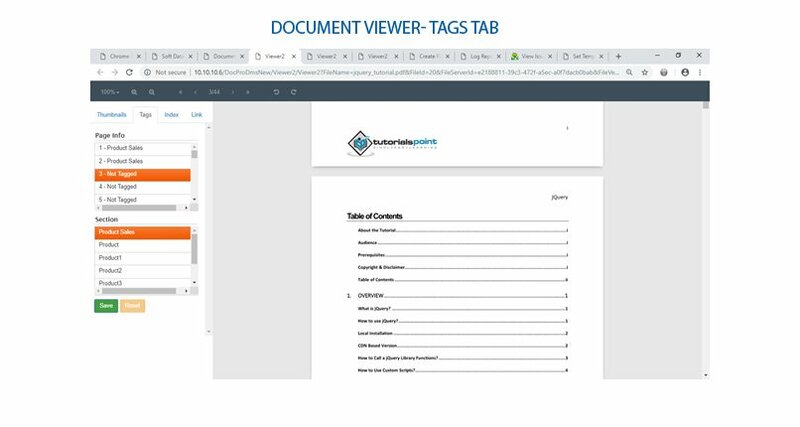 You can also use the Annotation feature to redact sections of the document that you think is sensitive information and should not be visible to certain section of users. Annotation also gives you features like watermark, text replacement, redaction, underline etc. Your users can choose from multiple options to upload the documents in DocPro. Using DocPro Desktop: Users can upload files using the desktop application. Documents in DocPro DMS are stored in folders. You can create your own folder hierarchy as per your organisations requirements. DocPro provides many properties that you can apply to each folder to suit your requirements. Indexes define the fields based on which the documents will be searched. DocPro gives you complete control on how you define the indexes with validations for each of them. You can also define whether an index is mandatory. You can use these indexes for searching the documents quickly. DocPro maintains a comprehensive audit trail of all of actions and changes that take place on the files in DocPro DMS. A detailed log for every document can track all events that have taken place throughout the lifecycle of the document. You can get the audit trail for a particular period, folder, document, user etc. Audit logs are important to keep a tab on all the activities happening in DocPro. DocPro supports all the major file formats like Microsoft Office files, Open office files, image formats, PDF, AutoCAD drawing formats and many others. You can get the list of supported formats here. You can upload, view and use other features of DocPro DMS for all the supported formats. 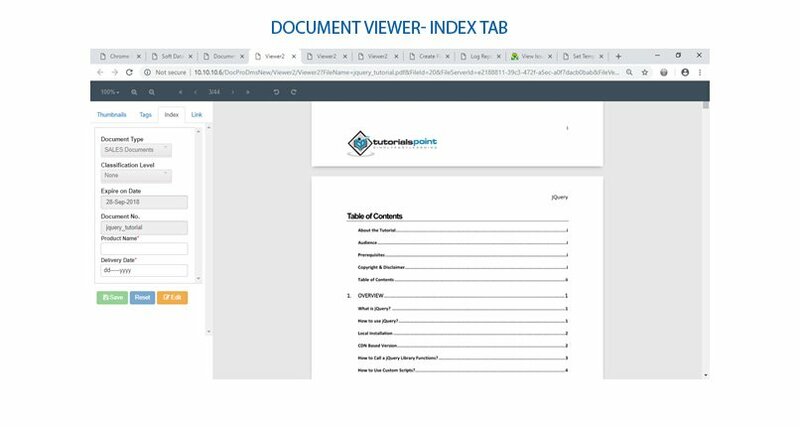 DocPro document viewer allows you to view the documents online, so that you can view the contents of the document easily. The viewer has easy navigation features apart from zoom-in/zoom-out, rotation, index-information, linked documents etc. DocPro viewer supports all types of commonly used document formats. You can get the list of supported formats here. DocPro DMS has a completely configurable workflow management module. You can design your business process workflows using the workflow configurator. Create your own data-entry fields and incorporate business rules based on which the document flows through the various activities in the business process. 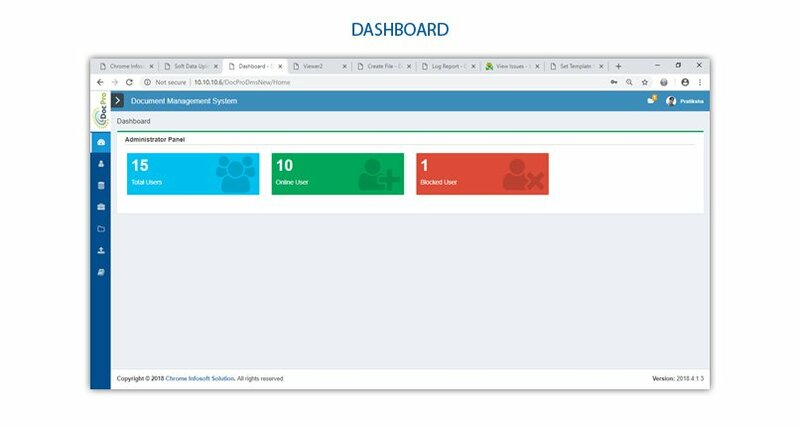 DocPro gives you complete visibility of the business processes, allows you to monitor and take corrective action to resolve any bottlenecks in real-time. DocPro has many easy and intuitive search features that allow users to get access to the documents they need immediately. You get a single field in which you can enter your search phrase and DocPro will give you the results across all documents where the phrase occurs in the index fields, file name, control number and document number. You can enable full-text search by simply clicking ‘Search in File contents’ checkbox and immediately you can search for the phrase within the file contents. 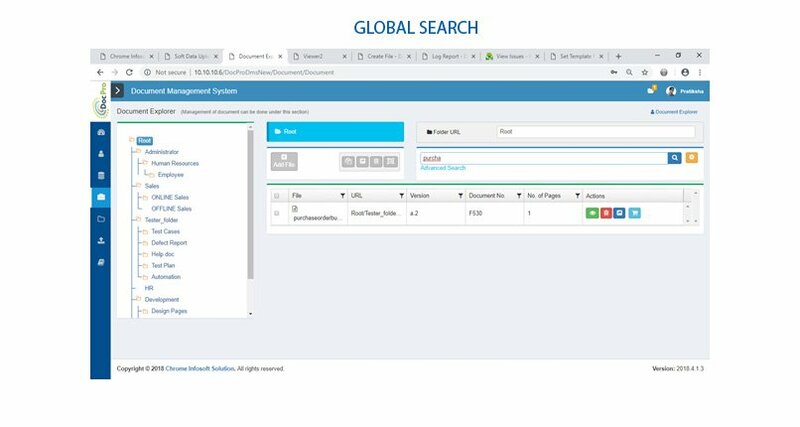 Advanced Search gives you the ability to create your own search queries and save them in case you want to use the queries again. Advanced search gives you the ability of searching on index fields, with more granularity to give you exact search results. Advanced search has options of adding multiple clauses using And/Or conjunctions. Each clause will have an index field, operator (Equals, Contains, Start-with, Between etc) and the search value. DocPro document management software brings numerous benefits to your organization and helps you and your organization become a big success. DocPro document management system from Chrome Infosoft is an evolving and customizable solution ideal for your organisation’s document management process. You can use DocPro DMS to enhance business processes at every level of the company. The system offers a layer of robust security and is perhaps the safest way of storing and managing documents and files. If you would like to learn more, you can request for a free demo from our experts here. DocPro Desktop application for Scanning, Document Upload, Index Entry, Download etc.